First day of FT2010 was described [here]. Now let me share my experiences from the second one. 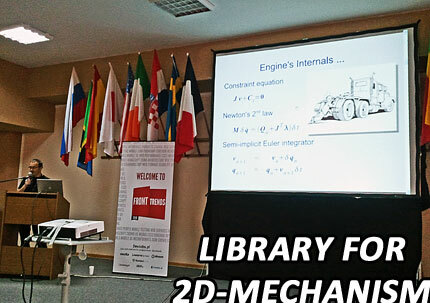 Another lecture was prepared by Christian Johansen. 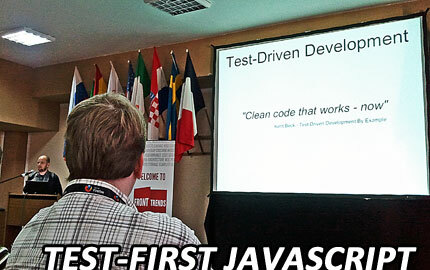 He presented the idea of Test Driven Development using Live Search jQuery plugin as an example. There was a bit of theory and a lot of live coding. 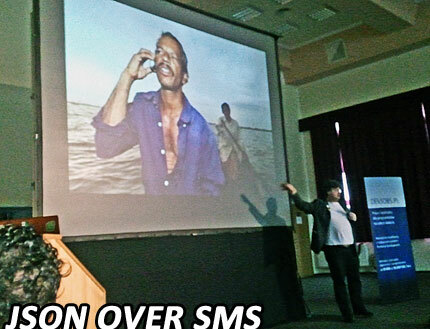 I was really looking forward for the PhoneGap speech by Kamil Trebunia, former employee of Nokia. He started with advantages of cross-device development and presented basic aspects of creating applications using HTML5 techniques. 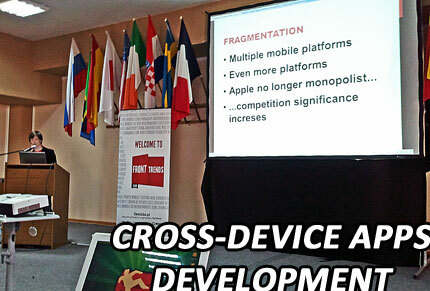 Then showed crossmobile tools like Phonegap or Titanium Mobile with their pros & cons. After discussing jQuery Mobile and Sencha Touch as examples of JS mobile frameworks Kamil shows few hacks and tricks for performance boost, like optimizing reflows (using CSS3 transformations instead of changing absolute style attributes like positions or margins, etc.). After the speech we had nice talk about future of cross mobile development together with Markus Leutwyler and one Wikipedia guy from Italy, unfortunately I forgot his name. Unfortunately I was not able to be present on all of the lectures - I regret the most "Mobile UX and current trends in mobile design" by Anthony Ribot. If there is any video from that one please publish it somewhere! I would like to thank anyone I was talking with. Also organizers for that awesome event. And guys from PALM for my PRE phone (I hope so, it still stuck at customs:) ). 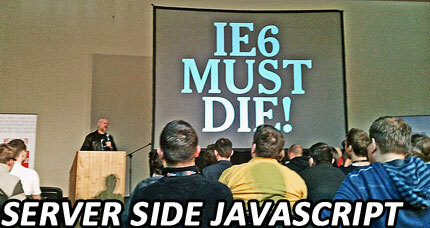 It was exciting to meet first league of world's frontend developers not even leaving my own city. I hope I will feel the same after FalsyValues! First day of Front Trends conference is behind us now. 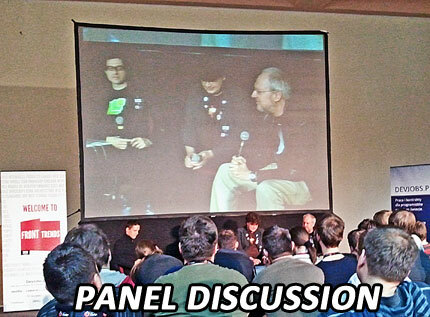 First time ever so many JavaSript 'gurus' met in Poland. As the participant of this event I would like to write a few words about it. But the worst part of the opening was short speech made by ZlapTaxi guy, who said at the beggining that if you want to make cross-mobile application you have to build huge team of Java, Objective-C, Symbian C, Cpp and God only knows what other developers (have you ever heard of PhoneGap? Oh, sorry, it was next presentation and it is so hard to read all that up to date stuff in the Internet). After explaining how to use his catch-a-taxi app and announcing a contest, he state that if you will find girl in Front Trends tshirt somewhere there, she could helps you order a taxi. So why he build that app for if there are girls to do this? Never mind. 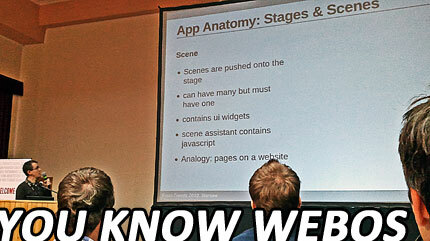 First speech I was attending in was "You know webOS" by Markus Leutwyler. Markus presented webOs history, main tasks, and devices that webOS is running on (even kind of printer with that Os - sick!). After that he discussed basics of webOs development - Mojo framework, building and connecting Scenes & Controllers. 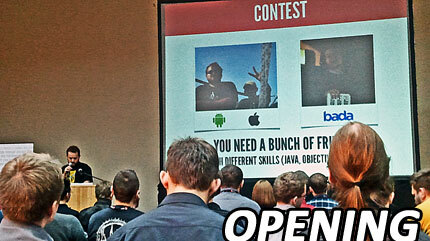 He finished with few words about jailbreaking and rooting Palm devices, testing & packaging created apps. Everything was clear and nice (especially I like his pronunciation of the name "webOS", maybe it is Swiss accent or something, I'm not sure:) ), but if you ever create even one simple webOs application - you already know everything Markus was talking about. For sure - if I hadn't written anything on webOS before,I would start after this lecture! 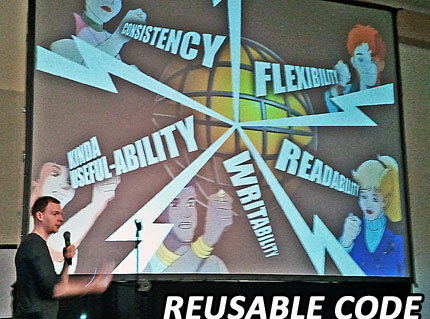 - and if you want to be good JS developer you must use js frameworks and you couldn't use it simultaneously. Tomorrow second day. I'm really looking forward for it! Animation is the rapid display of a sequence of images in order to create an illusion of movement. 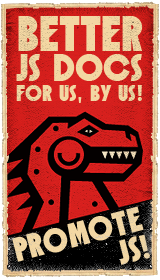 There are few methods to achieve that effect in JS, and I will discuss four of them in here. //width & height are assigned directly to th canvas, not to the canvasStyle because in the other case it would scale the element, not change its size. //main function for rendering each frame, here will all the animation logic goes. The clip property lets you specify the dimensions of an absolutely positioned element that should be visible, and the element is clipped into this shape. //IMPORTANT: even if we crop piece of source image, it's top & left attrs dont change - it's necessarily to move it to the fixed position. That's what I made above. - very lot of math needed on each move/frame changing. //put image in the canvas/div and add it all to the body of the document.